Learn to print your own Christmas Cards at the upcoming printmaking workshop at the Beverly Heritage Center. The workshop will be taught by Karl Mulac a local historian and the proprietor of The Randolph Enterprise Project. The introductory workshop will take place Saturday, November 17, 10 a.m. to 4 p.m., with a lunchtime break. Mulac will share some of Beverly’s printing history including the use of a field printing office during the American Civil War. The attendees will learn some of the methods used to create and print illustrations during much of the 19th century. Participants may bring a sketch of their own simple 4” x 5” design, or may work from clip art, to create their own linoleum block for printing. Attendees will learn proper use of the equipment and will take home their block and printed cards at the end of the workshop. Mulac has been collecting and restoring 19th century printing equipment for nearly twenty years. 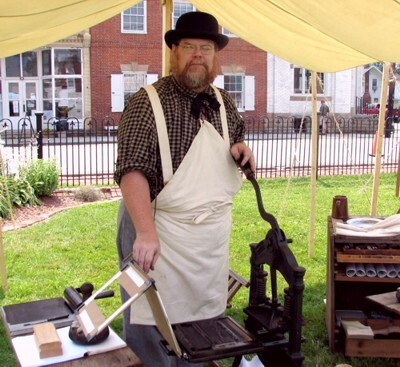 He has been doing printing demonstrations at the Beverly Heritage Center for five years. The Randolph Enterprise Project is a working 19th century printshop that represents Beverly’s newspaper as it may have looked in 1874. Attendees are recommended to be age 15 or older due to the use of sharp tools. While the instruction is free thanks to support from the West Virginia Sesquicentennial of the American Civil War Commission, a materials donation of $10 is requested. For the lunch break, participants can bring a sack lunch or eat at Back in Tyme across the street. Workshop reservations are strongly suggested as class size may be limited. For workshop reservations, call the Beverly Heritage Center at 304-637-7424 or email info@beverlyheritagecenter.org.